The Orchard contains 140 trees. yellow with red streaks. Attractive blossom. Raised in Gloucestershire around 1700. Complex flavour (both sweet and sharp), with firm white flesh. Attractive blossom. Raised in Northamptonshire around 1840. Unusual oval fruit, flushed deep red, juicy, crunchy and with an intense flavour. flavour and firm texture – good with cheese and for cooking – keeps its shape. Introduced by William Brownlees, nurseryman of Hemel Hempstead, in 1848. Crisp and juicy with a rich flavour. Greenish-gold fruit, sometimes flushed orange-red, with fine russetting. Attractive deep pink blossom. puree and can also be eaten raw with pleasure if you like the flavour of aniseed. aromatic, very sweet and juicy, with a firm texture, delicious to eat raw, and keeping its shape when cooked. An ancient French variety of russet apple blushed with red, first described in 1613, but more than likely older and may be Roman. stored and at its best from December to January. Introduced around 1825 by the same Richard Cox who raised Cox’s Orange Pippin. A handsome yellow apple, heavily streaked with crimson. Crisp and juicy if eaten fresh, more mellow as it ripens. When cooked the flesh is white and melting, needing little sugar. nutmeg flavour. Crisp and juicy and best after a warm summer. Stores until May though it becomes softer with storage. Raised at Ware Park in 1940. Raspberry flavoured, sweet, balanced and juicy, with soft flesh. Dating back to 1904, raised by Rev. Ellison of Bracebridge in Lincolnshire. Crisp, juicy fruit with a rich, almost aniseed flavour. Raised at Ware Park in 1937. Sweet, rich and aromatic. 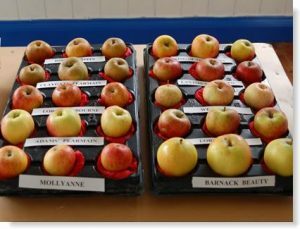 At best recalls Cox’s Orange Pippin. picking. Like all early apples it does not keep. renowned for its stunning appearance. Raised by Gavin Brown at Bayfordbury in 1956. Lightly aromatic, sweet and quite rich. by Michael Clark of Tewin Orchard. The flesh is creamy, sweet, very juicy and with a pleasant flavour. Bright pink blossom. with golden skin flushed tawny red. in September in South-East England and does not keep. Buckinghamshire. Slightly conical apples, with a deep crimson flush and juicy, aromatic flesh. A late dessert apple and a cross between Cox’s Orange Pippin and Court Pendu Plat, with the expected rich flavour. Medium-sized fruit which is firm and juicy, and slightly sharper than a Cox. when it was dried and used for tarts as well as being eaten for dessert. greenish-yellow fruit flushed bright red. A late dessert russet apple raised around 1785 by Mr White, steward to Lord Foley of Stoke Edith, Herefordshire. Small golden apples, produced prolifically and packed with flavours of pineapple and honey. Pretty blossom. with a few stripes of red and an occasional orange flush. Light, refreshing taste and juicy. Golden Delicious (and the highest of any apple). and a faint red flush. The firm flesh is white, sweet and aromatic. Raised by Thomas Rivers of Sawbridgeworth c. 1850. An excellent dessert apple – crisp, juicy, sweet and with a rich, perfumed flavour. First mentioned in 1831. A late dessert apple, with greenish-gold skin flushed with orange-red and with fine russetting. Pale cream flesh with a rich sweet/sharp flavour. A reliable cropper, with good blossom, and highly regarded. Stores until March. apple, the skin heavily streaked with red and with sweet spicy flesh. near Sherborne, Dorset. Firm flesh when young, developing a complex sweet flavour reminiscent of pears when mature. Raised in Barnet in 1952. Sweet flesh with a rich, spicy flavour. Laxton’s Superb is one parent. An enormous dessert apple, with pronounced russetting. Its origin is unknown. Slightly sharp, but not to cooking sharpness. Not easy to bite, due to its larger size! Keeps well into March. and has a good sweet/sharp flavour; it is also a refreshing and mild sweet eater. Raised sometime before 1935 at Letchworth by Miss E.L.Young. Pale yellow skin and red stripes. White flesh, which is sweet and fragrant. Sussex. Received RHS Award of Merit in 1920. Grown commercially in the UK until the 1930s. Can be stored until April. after his daughter who died aged 13 months. Large sweet fruits, keeping their shape when cooked and needing very little sugar. Can be stored until April. Striking deep pink and maroon blossom. for most culinary purposes and needs little sugar. A good baking apple. Raised in Bushey in 1897. Very beautiful yellow fruit, flushed red. Sharp, acidic cooker. Attractive blossom. A colourful sport of the well-known Newton Wonder – which cooks to a creamy puree and makes good baked apples and mincemeat. Crops well and stores until March. Dated to 1921.
flesh, which cooks well. Can be picked in August; keeps until November. Usually green turning yellow, but may go red in full sun. juicy fruit which cooks to a cream puree and has a slightly acid flavour. Edwardian gardens as it makes a decorative tree with good blossom. fruit with a slightly dry texture. Cooks to a rich puree. Famous for its long keeping properties – it was said it could keep for 2 years. Very long-lived trees with a spreading habit and pretty deep pink blossom. also stores well, staying firm for months. Lane’s Prince Albert in 1857. Large, shiny fruit, green flecked with red. Purees well, and by March becomes a dessert apple. Raised at Rivers’ Nursery in Sawbridgeworth in 1847. Medium-large yellow fruit with good acidity. with an orange flush and broad red stripes. large with a yellow skin, streaked scarlet, and cooks to a translucent gold puree. for baking and for puree, when it needs very little sugar. Sometimes said by professional cooks to be the best cooking apple of all. flavour – a rich culinary apple. valued for its rich flavour by the Victorians. hard cider. English cider is traditionally produced using blends of Sweet, Bittersweet, Sharp, and Bittersharp juice. Green fruit, flushed red, with a bittersweet flavour. This vigorous cider variety originated in Somerset and the fruit is ready in November. the west country and Herefordshire. Medium sized red flushed fruit. Produces a sweet, astringent juice and medium bittersweet cider. A cider apple believed to have been raised in the late 19th Century by Harry Masters of Yarlington, Somerset. A dark red flushed fruit. The sweet, medium tannin juice produces a full bittersweet cider. A small dark red apple, originating in Somerset around 1900, which produces one of the best bittersharp juices. and sweet enough to eat fresh. The trees are large and vigorous. bittersharp juice which ferments to a sharp, often scented, vintage quality cider.